First off, a confession — I have been running Mountain Lion for months, since the first Developer Preview shipped. Aside from some early glitches rectified in subsequent beta releases, OS X 10.8 has been pretty much golden. 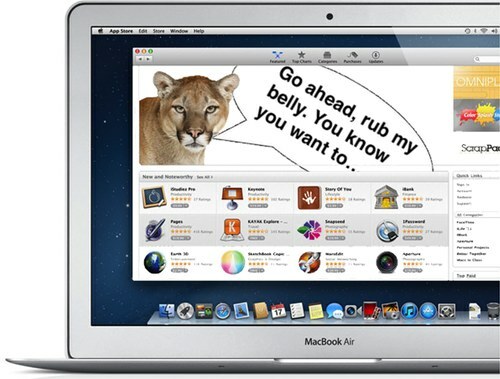 With that background, as well as the scores of positive reviews, choosing to upgrade to OS X Mountain Lion is both easy and safe for you. I mean, why not? It’s easy to install (one click to purchase it through the App Store, and then you just click a couple of “OK”s before going out for an hour or two while the installer does its work. And at twenty bucks, it’s cheap-as-free. Apple’s consistent message since they began their annual schedule of OS updates is that “these aren’t optional.” They’ve given people almost no excuse. If you have a compatible Mac [see link below], you’ll be running 10.8 soon. Because if you don’t install it this week, you’ll do it sometime in the coming six months, when an app you count on begins to require it. Nevertheless, answering the question — Should I upgrade to OS X Mountain Lion — is a dead simple, yes. The thing to quibble over is whether you should do it today or a few days or weeks from now. Whatever the case, with millions of happy users and scores of positive review already tallied, OS X Mountain is a no brainer.